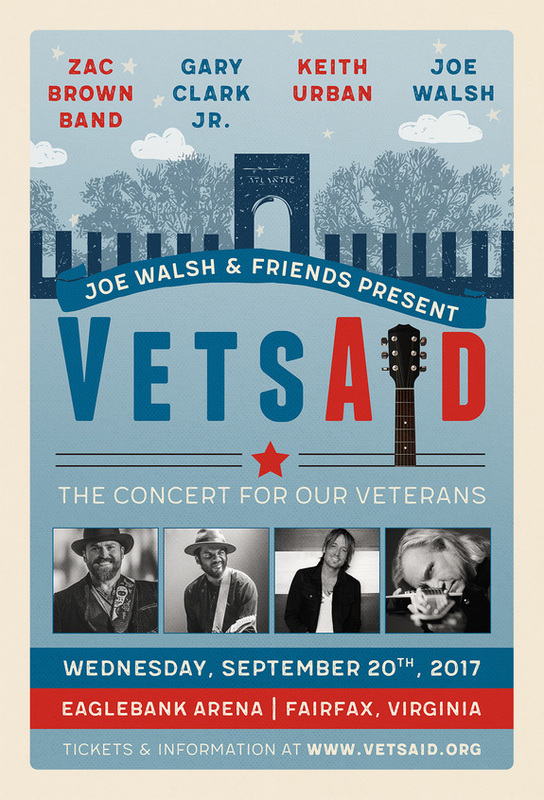 Today Joe Walsh, Rock and Roll Hall of Fame Inductee and multi GRAMMY Award recipient, announced his first annual concert to support VetsAid, his new 501(C)(3) certified national non-profit to help veterans and their families. Zac Brown Band, Gary Clark Jr. and four time GRAMMY Award recipient Keith Urban will be joining Joe on the bill September 20, 2017 at the EagleBank Arena in Fairfax, VA, with more artists to be announced soon. Tickets will go on sale to the general public on Friday, July 21st @10AM. Fan Club members will have access to a pre-sale starting Tuesday, July 18th @ 10am thru Thursday, July 20th @ 10pm. Not a fan club member? Join HERE. Veterans and their wellbeing have always been important to Walsh, a Gold Star family member himself. His father was a flight instructor for the first US operational jet powered aircraft, the Lockheed F-80 Shooting Star, and died while stationed, and on active duty on Okinawa when Joe was just 20 months old. Joe has been involved with veterans’ related causes for years, supporting various charities, visiting the Walter Reed National Military Medical Center and offering free guitar lessons to the wounded veterans there. He has campaigned for his good friend, Senator Tammy Duckworth of Illinois, an Iraq War veteran and double amputee. Joe aims to use this platform to raise funds and awareness for the still urgent and significant needs of our returning soldiers. Through the establishment of VetsAid and its annual benefit concert, he wants to give back to those who have given so much in sacrifice for our country. Consider these devastating statistics: In addition to the nearly 7,000 American Military Casualties of War from the wars in the Middle East since 2001, there are nearly 51,000 who made it home wounded. Returning veterans have a 50% higher suicide rate than other civilians. VetsAid plans to directly support a variety of established and tested veterans-based charities, namely those with a proven track-record that take care to provide complete and holistic care for veterans and their families, physically, mentally, emotionally and spiritually. Ticket info can be found HERE. Just watched the performance on Stephen Colbert show and was inspired to log on and contribute to VetsAid. Wish I could attend the show! Will try to see a show of yours here on the west coast. Keep on Rockin!!!! Devastated over sept 2017 HOB canceled shows!!! Me either, what the dealio?? I don't have a presale code either! Was anyone able to get their presale code? Thanks! Unable to find the pre sale code-Help... I would love to purchase tickets for this worthy cause!